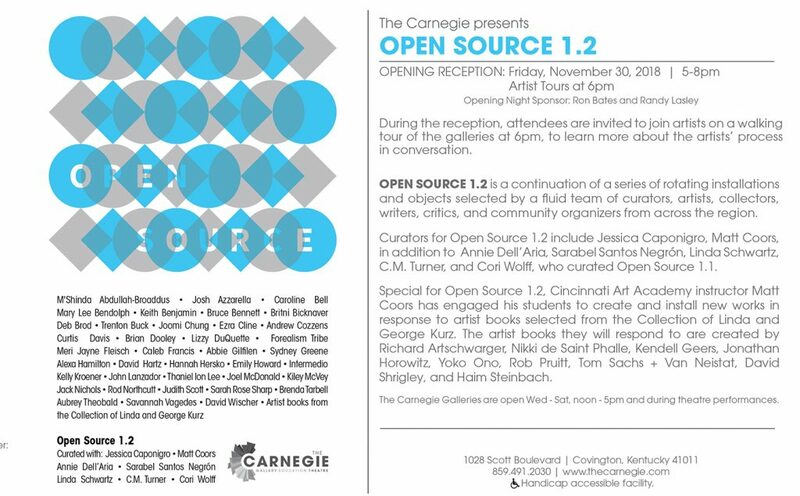 Excited to announce participation in the latest installation of Open Source at The Carnegie in Covington, KY. OPEN SOURCE 1.2 is a continuation of an experimental curatorial series of rotating installations and objects selected by a fluid team of curators, artists, collectors, writers, critics, and community organizers from across the region. Curators for Open Source 1.2 include Jessica Caponigro, Matt Coors, in addition to Annie Dell’Aria, Sarabel Santos Negrón, Linda Schwartz, C.M. Turner, and Cori Wolff, who curated Open Source 1.1. You can welcome new curators Jessica Caponigro and Matt Coors along with 16 new artists – Caroline Bell, Trenton Buck, Ezra Cline, Curtis Davis, Brian Dooley, Caleb Francis, Abbie Gilfilen, Sydney Greene, Hannah Hersko, Kelly Kroener, Kiley McVey, Jack Nichols, Sarah Rose Sharp, Brenda Tarbell, Erin Taylor and Savannah Vagedes – at the opening reception on Friday, November 30, from 5:00-8:00. It sounds as though the evening’s festivities will include a roving gallery tour by those artists in attendance. Thanks to Carnegie gallery director Matt Distel for allowing me to join the fun! If you’re near Covington, KY (just across the river from Cincinnati! ), do drop in!